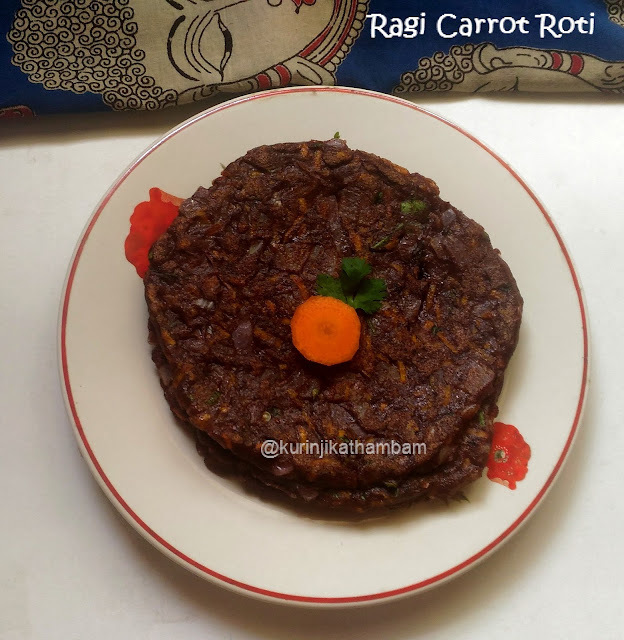 Ragi roti is normally made without mixing any vegetables. I added carrot which makes the roti more colorful and attractive. Recently we have starting having Ragi Roti as a full meal instead of snack only as it is a good healthy dish. Click HERE to view 50+ Millet Recipes. Preparation Time: 10 mins | Cooking Time: 5 mins | Yields: 10 nos. 1. In a wide bowl, add ragi flour, carrot, onion, curry leaves, coriander leaves, green chillies, cumin seeds and salt. 2. Mix them with the wire wish or with your fingers. 3. Add water little by little and knead it into a soft and pliable dough. Keep it aside for 5-10 mins. 4. Divide the dough into tomato size balls. 5. Spread over few drops of oil on the plastic sheet or banana leaf. 6. Now place the dough on the sheet and flatten the ball using the fingers. [Grease your fingers with oil]. 7. Now heat the tawa and place rotti on the tawa. Pour oil along the sides of the rotti. 8. Cook both sides of the roti till black spots appear on it. 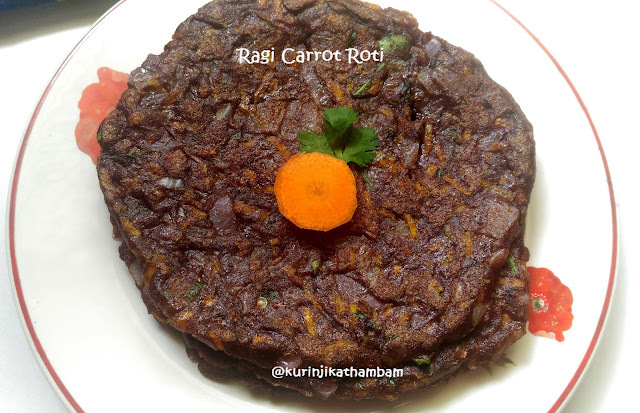 Hot hot healthy finger millet carrot roti is ready! Serve with tomato chutney. 1. Ensure that the consistency of the dough is neither too loose nor too tight. 2. You can add red chillies instead of green chillies. Love this. My favorite !